One of the tastiest and most consistent budget-priced brands in our humidor, Quorum shade is a bundled cigar from the esteemed J.C. Newman cigar company. 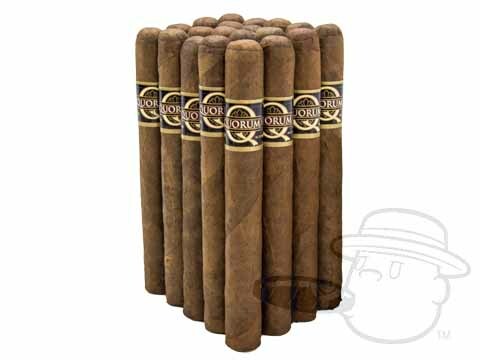 Handmade in Nicaragua, Quorum boasts rich flavor and a beautiful burn at an excellent, affordable price. Try Quorum today and see for yourself why they're the best-selling bundled cigar in the world. Save even more on Quorum Corona Natural with this special 2 bundle deal! Great everyday cigar. Smokes like a more expensive cigar. Perfect in size and price. This is the bigger brother of the Little Q cigars I have. Great flavor, solid build cigar. Gives about 45 to 50 minutes smoking pleasure. This cigar is a great smoke for the price. It has a snooth flavor and great burn. For the price I alway keep these in my humidor. Great go to cigar. Very consistent from the first to last. Draws well and holds together throughout. Even though it is not an expensive cigar, it gives a damned good imitation of one. Will definitely purchase again! I like these sticks for around the yard. Shipping was fast. Great Prices. Everything arrived and in good condition. Product was fresh. Best Cigar Shopping experience in many years. Strongly suggest everyone to give them a chance! I don't knw why these cigars are so hard to find. BCP always have them and are always at a great price. This is the only on-line cigar company I buy from now. Quorum Corona Natural is rated 4.4 out of 5 based on 19 customer ratings.